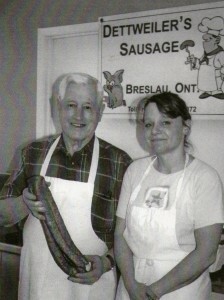 Dettweiler's Sausage We are located in the Rear Unit of 2057 Victoria N, in Breslau Ontario. Get grilling! We have pre-made kabobs, burgers, ribs and, of course, our famous sausages. 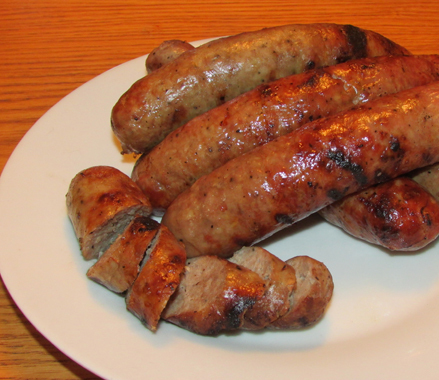 SMOKED SAUSAGE: We have both fresh and frozen smoked sausage in stock this week. FRESH SAUSAGE: Since it’s Easter week, our new batch of fresh sausage will be ready by opening time on Tuesday morning. We have a variety of fresh (unsmoked) sausage in stock: Dettweiler’s Original (plain fresh), garlic, oktoberfest, double garlic, sweet chili heat and breakfast sausage. PEPPERETTES: We have mild and hot and flaming hot pepperettes in stock. We are sold out of five alarm. CLOSED on Saturdays of: Victoria Day, Canada Day, Civic & Labour Day week-ends. OPEN on Saturdays of: Family Day, Easter & Thanksgiving week-ends.